"The new solar cell is not photovoltaic—it's photosynthetic," says Amin Salehi-Khojin, assistant professor of mechanical and industrial engineering at UIC and senior author on the study. 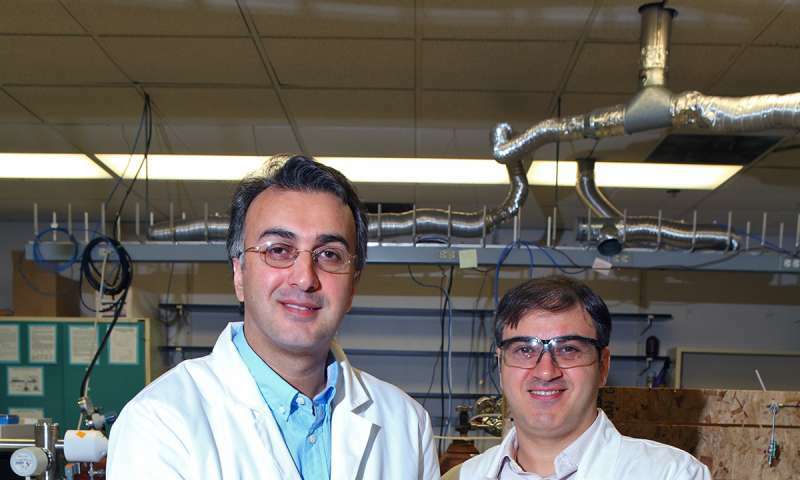 Salehi-Khojin and his coworkers focused on a family of nano-structured compounds called transition metal dichalcogenides—or TMDCs—as catalysts, pairing them with an unconventional ionic liquid as the electrolyte inside a two-compartment, three-electrode electrochemical cell. In fact, he said, the new catalyst is 1,000 times faster than noble-metal catalysts—and about 20 times cheaper. Not sure about that. While you can probably get some fuel out of the (very thin) CO2 atmosphere you have to have oxygen to burn that fuel again. "We take our flamers, go down to the planet and torch the alien queen!....Whaddaya mean 'no oxygen in the atmosphere'?" Any bets that this technology never sees the light of day again? "hydrogen and *carbon monoxide gas bubble up from the cathode*, while free oxygen and hydrogen ions are produced at the anode. "The hydrogen ions diffuse through a membrane to the cathode side, to participate in the carbon dioxide reduction reaction," "
So what happens to the carbon monoxide??? you have to have oxygen to burn that fuel again. Tell me, what becomes of CO2 when you remove the carbon? precisely. This process produces both fuel and oxygen. Both must be stored but that is essentially the narrative. we just happen to live on a planet with lots of excess O2 in the atmosphere so we don't need to carry that part. but, a battery looks much more practical for Mars. If I have to store and carry my oxygen and fuel then the benefits of energy-dense hydrocarbon is pretty much nullified. "uses sunlight to remove CO2 from the atmosphere and produce burnable fuel"
Isn't that what trees do? If I have to store and carry my oxygen and fuel then the benefits of energy-dense hydrocarbon is pretty much nullified. It's the same thing for batteries as well. It's just not oxygen that does the "oxidizing" but another chemical, and that other chemical is often much heavier than plain old oxygen. That's part of the fuel they're talking about. You feed the hydrogen and carbon monoxide into the Fischer-Tropsch process, and you get higher molecular weight carbon-based fuels out of it. And on another point, if you're going to manufacture it from local materials, it's easier to pull oxygen from air than mine for minerals underground. The system they have doesn't capture the oxygen. I have always used a solar power density of 1000 watts /m^2 . Is this a typo or does it truly require 10 times less power. The economy and environmental footprint of these expensive academical nonsenses is disputable from their very beginning. "When light of 100 watts per square meter - about the average intensity reaching the Earth's surface"
This is the one. This spells liberation and gives the space for fully practical nuclear, and I pray (which is not my habit) that there is nothing to keep it from full scale use. Soon. Looks pretty good. Turning atmospheric CO2 into syngas will put the carbon into the fuel cycle instead of into the atmosphere. One problem ( on earth, anyway) - what happens if we run out of CO2? Wonder how it would go with solar concentrators. What affect does temperature have on the system? I've been hearing about nanotube research in this area out of the University of Pennsylvania, but I guess theirs used the gummy, expensive catalysts discussed here. When they have a system that is reliable and cheap enough to go on my roof to power a 5 kw generator all day, that's when I'll get excited. How much of the Earth's surface would need to be covered with these solar cells to create enough of this fuel to replace the billions of gallons of liquid and gas fuel used today? 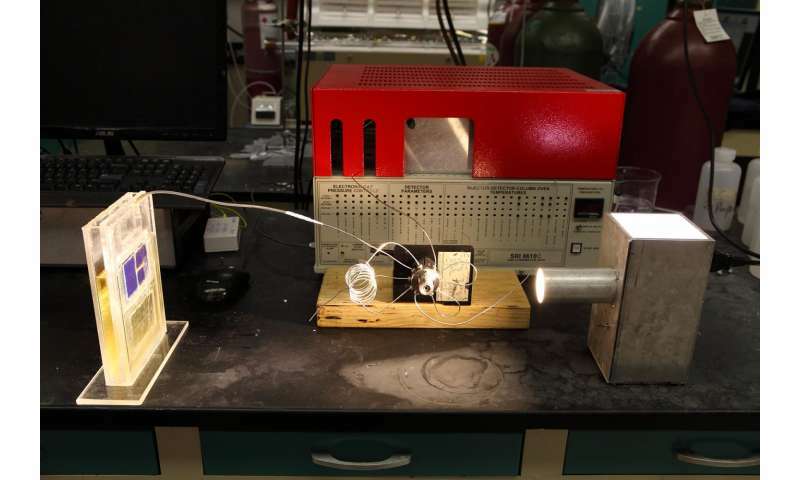 The catalyst might be cheap, but making the solar cells isn't. As concerns having to carry around oxygen, you may want to do that anyway for breathing. On Mars there is no free oxygen and this technology can produce it. Either you use this for producing oxygen for breathing purposes - in which case the entire hydrocarbon fuel part is a waste since you have no oxygen left to burn it..or must implement yet another process to create oxygen so that you can burn this stuff. Creating oxygen is something we'd want to do on Mars. But I'm fairly certain that if we drop the entire 'hydrocarbon fuel' angle from the design specs of a system that there is some more efficient way to do it. Hydrocarbon fuels are also very inefficient when burned. Going for a closed hydrogen/oxygen-H2O fuelcell cycle (or just batteries) seems a lot more efficient use of solar power for moving stuff about. Producing metals out of the martian soil is going to give you a big waste stream of oxygen anyways because the mineral ores are all oxides. Plain rock is full of oxygen. Getting nitrogen for breathable air is going to be the bigger problem. Carbon pulled from the atmosphere is also useful for chemically reducing the metals from their ores. Besides, you're going to be growing food on Mars for the colony anyways, and what do plants do? They release oxygen. Take the C out of CO2. That's pretty naive. It depends how you remove the carbon. "And George - that last ba-dmp-bmp was pretty lame...:-)"
If you have to produce silicon in order to breathe you have a big problem :-) . The oxygen is not consumed by breathing it. It returns as CO2 which is recycled back by the plants used to make all the food the population eats. For a given population of people, you will only need to add a certain amount of oxygen once and then simply replace what leaks out. The oxygen gained from minerals and metals extraction is surplus. Same as with pulling CO2 out of the atmosphere to turn it into fuel - the oxygen released on the side is surplus and free to use to later oxidize the fuel for energy. That is how it is on Earth. What makes you think it is viable to grow plants on Mars just for the sake of producing oxygen ? It will take a lot more than you can eat. How do you think of having a colony on mars if you can't grow your own food there? It's pretty much assumed you can, or you won't be going there anyhow because the logistics of continuous supply from earth is just too damn expensive. Growing enough food for you to eat releases exactly the amount of oxygen needed for you to metabolize that same food, and there will actually be an excess of oxygen because parts of the plants are inedible. The excess carbon and oxygen have to be burned to keep enough CO2 in the system for the plants to grow. I love this!!!! I am involved in Auto sports. This will allow us to run 1000 Hp machines that are co2 Neutral. Where the hell is my 9 mpg V8 Big block. But it didn't say this method could actually do it, or even has the potential to do it, at a cost comparable to manufacturing gasoline from oil. "The ability to turn CO2 into fuel at a cost comparable to a gallon of gasoline would render fossil fuels obsolete." There's and economic catch here. The source of ethyl-methyl-imidazolium tetrafluoroborate is... wait for it... the petro-chemical industry. The petro-chemical industry (about 5% of the total petroleum industry) is economically dependent on the economy-of-scale of the petroleum industry. The bulk of the petroleum industry is transportation and heating fuels. Doing away with petroleum fuels while great for the environment will have huge down stream economic/cost increase impacts on the petro-chemical industry including food production, pharma, plastics and the synthesis of ethyl-methyl-imidazolium tetrafluoroborate. So, like biofuels it turns out the process to get rid of petroleum is also economically dependent on the petroleum. What about capturing the carbon right from the exhaust of a car rather than the atmosphere? This is because making hydrogen biofuel is a deeply flawed strategy and only in part because each molecule of H2 leaked into the atmosphere, and there would inevitably be wide spread leakage if the so called "hydrogen economy" is ever realized, has many time the greenhouse effect as each molecule of CO2. If the whole point of this is to stop global warming, its a non-starter. Plus efficient compact H2 storage is a major issue. Plus it is unsafe as it easily explodes if accidental mixed with air in an accident; -you certainly wouldn't want your cars to store H2 in a car pile up! Much better to stick to other types of renewables. If this production could be made in a small scale such as in a car, and then used almost as soon as it is produced, then you would likely not need to store a lot of it. I would assume we in this case still should see a substantial reduction in emission. At the largest scale here we have usable knobs on the CO2/O2 content of the atmosphere and probably a lot of chemistries. Who will decide on the real time setting of those knobs? Better settle that up front. If it's done locally all kinds of new cycles and dynamics could ensue and we won't be any better off than we were. If even.